Today I’m introducing you the feature of this week which is the www.dresstells.com website. Dresstells is the global leading online retailer for wedding gowns, special event dresses, wedding party dresses, homecoming dresses, prom dresses and accessories and it was founded in 2013. Customers can browse the vast online selection and choose their favorite dresses with great satisfaction. Dresstells is proud of its exceptional customer service, high quality and affordable prices, they are always concerned about the fabric features and even more about all the details which can make a wedding or a party different and perfect. They are ready to help you achieve your goals and since standard sizes are not suitable for everyone, they suggest their customers to choose their customized dresses that can make you shine, all you have to do is contact them and ask for your personal dress choice. To make sure their dresses are perfectly comfortable, they are using unique features as gossamer and firm fabric. The focus is on their Homecoming Dresses, which are sorted by prices. They are some cheap ones too from $79.99. Mermaid Prom/Evening Dress – Black V-Neck Sweep Train with Appliques: I love the design of this dress and the fact it’s black make it so elegant and chic, perfect for a night to remember. 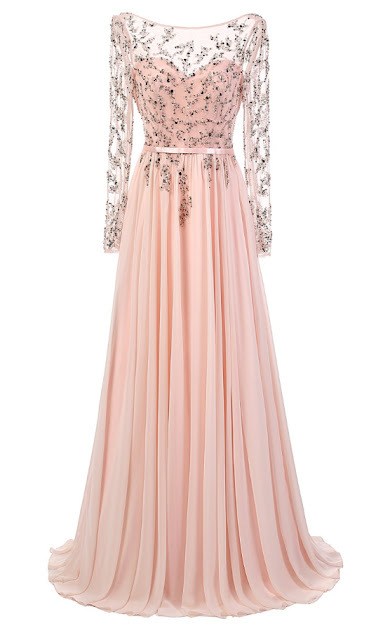 Elegant A-line Scoop Floor Length Pink Prom/Evening Dress With Long Sleeves: this dress has a light shade of peach and it’s lovely design are a spot on for a evening out. A-line Halter Floor-length Black Chiffon Open Back Homecoming Dress with Beading: this dress reminds me of my Barbie’s one. It’s just so doll-like! I love the details at the top and the black and white choice of color.